They were a rowdy lot… very obviously extreme Goon-type fans attended this show, with many of the audience quoting lines along with the actors, laughing before punch-lines and generally having a great time. After the show, a lot of the crowd stayed around for about an hour and a half afterwards, meeting the cast and having a chat about their favourite Goon moments. Autographs too were hunted down. All in all, a raging success. Photos and reviews will be posted next week… but we thought that you should know, just in case you haven’t picked up your tickets yet. 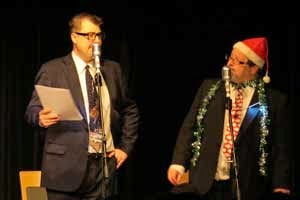 Come on, check out The Goon Show LIVE! Only a dew shows left now… book here, or read more here.